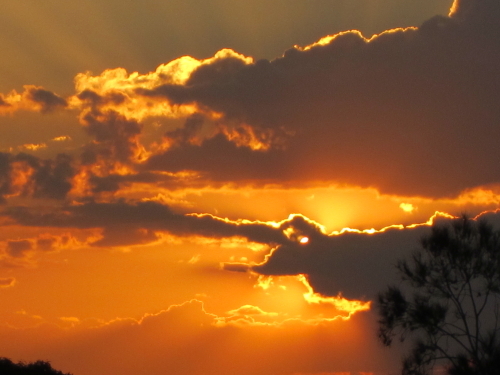 Those of us in the Southern Hemisphere will be celebrating the Winter Solstice tonight – the longest night of the year. The long, cold, dark night gestates and finally gives birth to the reborn Sun. The old gives way to the new and the night gives way to the day. The days will now get longer and the nights shorter until the Summer Solstice. On that night the reverse happens as the Wheel turns and begins its solar, lunar and seasonal dance anew. When I think of the Winter Solstice I think of what the longest night would mean to – well – to vampires 🙂 Night is when vampires come alive so the longest night must be their favourite. It certainly is one of mine. Years ago I saw a frightening movie, 30 Days of Night. In this film vampires take over an Alaskan town just as the sun sets and won’t rise again for 30 days – that is one long night! But just how important is it for vampires to avoid the Sun? 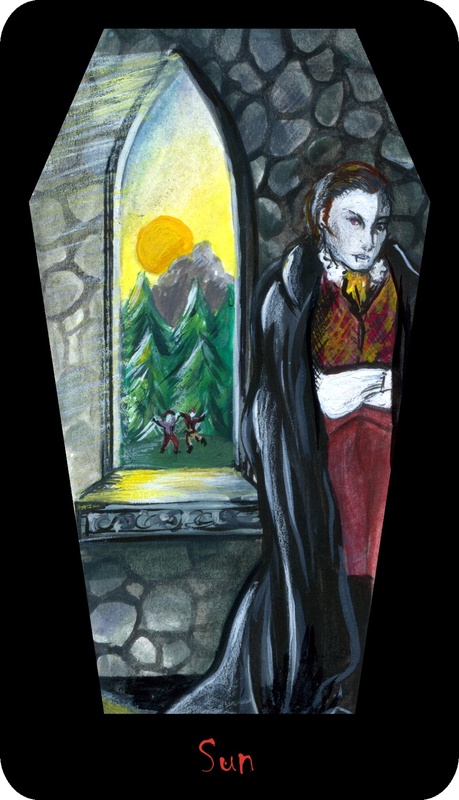 In The Dracula Tarot I explored the sun and vampires through the tarot Sun card. Below is a condensed piece that draws on my analysis of Dracula through both the Sun card and the Hermit card – both key cards for the Winter Solstice. In many folkloric myths, the power of the vampire may be dulled during the day, but the sun does not kill them. Many early vampire stories have their vampires walking about during daylight hours, although they do prefer the night. This is particularly so with Stoker’s Dracula. Although it first appears as though the Count is vulnerable to sunlight, this is not the case. Dracula’s sun sensitivity is mainly evident in the first few chapters during Jonathan’s stay at the castle, but when in England, Dracula is seen in the daylight a number of times with no ill effects. Although restricted in sunlight, Dracula is certainly not as vulnerable to the sun as popular mythology would have us believe. Dracula can move about during the day, but like most vampires, he prefers the night. The power of the sun in Dracula appears to be linked to spirit, vitality and new life – much like the tarot Sun card. In England, Dracula begins to personify the spirit of the tarot Sun. Dracula’s excitement at being in a thriving country is reflected in the number of daylight appearances he makes. Jonathan spies Dracula in daylight, following a woman who will no doubt be his feast. Dracula also visits the zoo, confronts the vampire hunters and books passage on a ship, all during daylight hours. Dracula’s forays into the sun coincide with the injection of new blood into his supernatural body. In England, Dracula is surrounded by people who are easily his prey. Glutted on an abundance of human blood, Dracula not only begins to look younger, but he is stronger and more able to tolerate the sun’s rays. Although Dracula is predominantly a night creature, he is nonetheless free to wander about during the day. 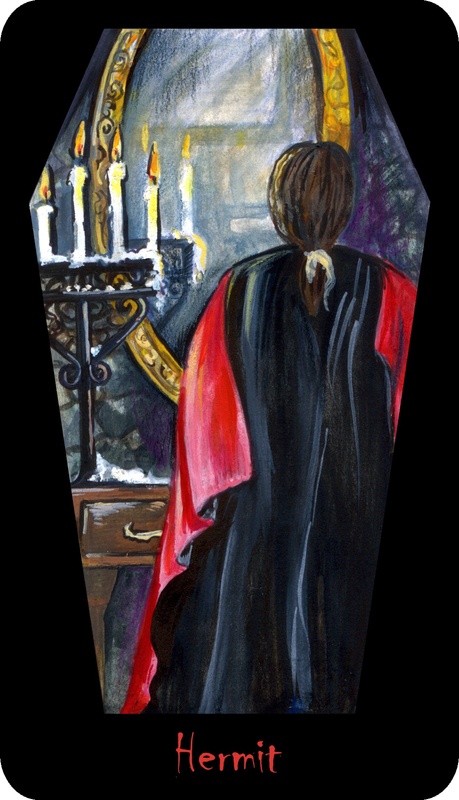 Dracula’s trip to England reflects the tarot Sun card as the journey is filled with possibilities. For a brief moment in his life, Dracula experiences the pleasures of being in the world, hunting in freedom and walking in the sun. It may seem strange to picture Dracula as a man about town in Victorian England, walking the streets in full sunlight. But don’t worry, Dracula, like most vampires, is still a creature of darkness. You can’t take the black cape and inner darkness away from Dracula, no matter how long he spends in the sun. The key to Dracula, as with most vampires, is that he loves to brood! Vampires’ long lives and self-reflecting natures link them to the tarot Hermit card. The Hermit represents reflections on the past, present and future, and Dracula is no stranger to such musings. During his stay at Castle Dracula, Jonathan is privy to Dracula’s meditations on all these aspects of his life. The longevity of the undead vampire allows us a unique insight into a figure that has experienced the passage of centuries. Dracula has watched, experienced and reflected upon his growth from celebrated hero into shunned vampire. When Dracula looks into the mirror, he casts no reflection. As a soulless creature he cannot reflect upon himself or see his vampiric changes. Dracula must seek such outer reflections in the faces of others. Sadly what is mostly reflected back to him is the hatred, fear and loathing of his true vampiric countenance – his unreflected mirror self. So on this Long Night’s Journey into Day, what do you see when you look in the mirror? Dark moon nights are my favourite! I love looking into the dark night sky and seeing – well – darkness!! Well, not to bust your theory, but “sunlight” in England is not like sunlight in Australia. Here in the Pacific NW (with a climate much like England) we like to say that ALL sunlight conditions are only “partial sunlight”. Okay, maybe we are referring to gardening, and not vampire-ing, but still… Great article, nonetheless. If I were a vampire, (and I’m not saying either way) I’d stick with one of these dreary, cloud ridden places. Hey…wait…maybe that’s why I don’t like hot sunny places. Hmmm…I’ll let you know. Well you really have me thinking. At first I had a very scary image of an Aussie Vampire – tanned, wearing shorts, tank top and carrying a six-pack of beer – or blood! But then I started thinking – is it easier to imagine creatures of darkness in colder climes? Certainly my ghost stories were first told to me by my Eastern European parents who came from a much colder place than Australia! So I’ve done a bit of research and found this – our very own Australian Aboriginal Vampire myth!! Viva la research! I think it IS more easy to imagine scary stuff in a dismal climate. It breeds brooding melancholy to live in a place with so much darkness. I do like the image of the Aussie vampire, though. He would be hard to resist. I definitely look forward to Autumn and Winter the most. There is just something about watching the sun set early in the evening and the cold that follows. That Aussie vamp is really worth more research. Have to say I am also a long dark night lover and not looking forward to the never ending days that are soon to come. The hermit card is one of my favourites and as for looking in the mirror what I see is sometimes good sometimes not so good. Great comment about the mirror – sometimes good, sometimes bad!